YOUTH services in three of the borough’s most deprived wards have been refused grants from the council. Lib Dem and Conservative chiefs heard from youth workers that they feared a “nightmare summer” would follow unless more funding was found. Celebrated youth club Castlehaven Community Centre Association in Camden Town is one of the youth clubs facing a budget cut. She said the loss could force her to sack two key workers. Another youth club that will see its entire budget axed within weeks – unless it can find an alternative benefactor – is the Queen’s Crescent Community Centre in Gospel Oak ward. Cuts there would cause disorder to shoot up, according to the club’s Mick Farrant, chairman of the board. “Of all the things you want to cut in a deprived ward, youth work ain’t one,” he said. The Fresh Bar, a popular health club and juice bar in Highgate Newtown closed last month after money ran out. “This is a terrible decision,” said chairwoman Maggie Cosin. The coalition insists the funding changes are not cuts – more an attempt to spread money across the borough. But unusually its not just Labour councillors who are arguing against the policy. Conservative councillor Lulu Mitchell and the Lib Dems’ Jill Fraser both came out fighting this week, warning the cuts could lead to a nightmare summer if young people in their wards had nowhere to go. 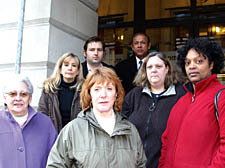 Cllr Fraser added: “I need to stand up for Haverstock. Robbing Peter to pay Paul does not help the kids in my area and they are the worst off in Camden. The youth clubs which lost out had poorer quality bids than their competitors, he added. He said where there were “gaps” in provision, the youth service, Connexions, would offer support.